Commercial roofing jobs are where the big bucks are made. A lot of roofers prefer commercial jobs because they are much more lucrative. A commercial job can sometimes be worth hundreds of thousands of dollars in revenue. However, there are big challenges involved with commercial roofing that you don’t see in residential. Some challenges include lead generation (still a big challenge with residential), dealing with more sophisticated buyers, and a more complicated sales process. What might work in a residential lead generation campaign might not work with commercial lead generation campaign and vice versa. On average B2C leads are going to be less expensive than B2B leads. However, there might be less competition with some channels that target the commercial roofing business. In the end, it comes down tracking your numbers and knowing exactly how much it costs to acquire a customer. In the rest of this article, I’ll go into detail and provide a general overview on how to generate commercial roofing leads for your business. By far, the most common strategy for generating leads for commercial roofers are referrals. Referrals are the backbone of the industry. Customers that come from referrals usually spend the most and are often the most loyal. The challenge with referrals is that you can’t control each month how many you are going to get. Eventually, you’ll reach a certain point in which you’ve tapped the amount of referrals you can get every month. The best way to get more referrals is to ask your happy customers for referrals. It’s amazing how many business owners I talk to forget to ask for referrals. The most common outbound sales/marketing strategy roofers use is canvassing. After a storm hits a certain area, roofers that move first usually have the first advantage. There is nothing that can replace a face to face meeting. Even though you probably won’t run into the owner of the property during a door knock, you can still set appointments and provide these leads to your salespeople. Ok, I Knocked. Now What? Telemarketing has been around for decades and many roofing companies use telemarketing to generate commercial leads. There are a lot of different companies that will sell you leads on an appointment by appointment basis. 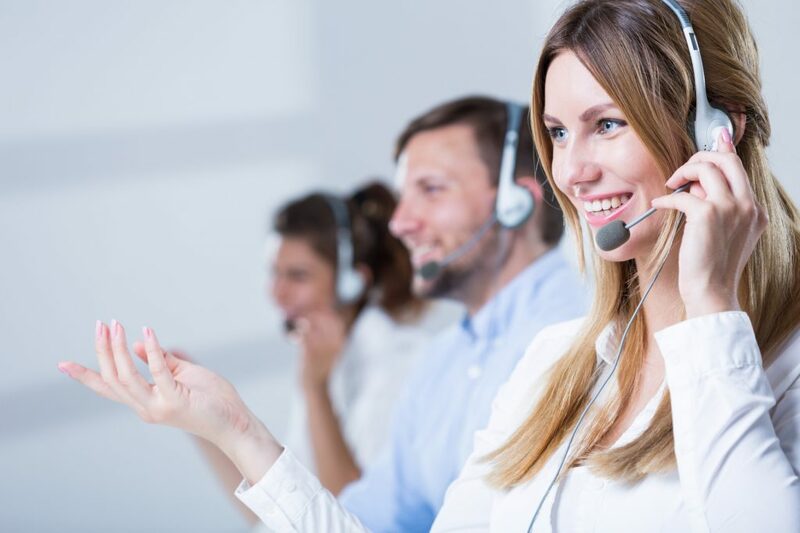 The challenge with telemarketing is that there have been lots of advances in technology that allow people and businesses to block out telemarketers. Telemarketing is a quick way to generate leads. However, you are not building your brand, your name, and your reputation by using telemarketing. I’ve heard mixed results with telemarketing and like most things the success depends on the vendor and client making things happen. If there was a way to quickly target commercial property owners at the top of the buying cycle would you be interested in reaching them? The beauty of AdWords vs. these other channels is that you can quickly see results, usually within a week. Companies like Centimark, Tecta America, and Nation’s Roofing are spending millions a dollars over the last few years on AdWords for a reason. 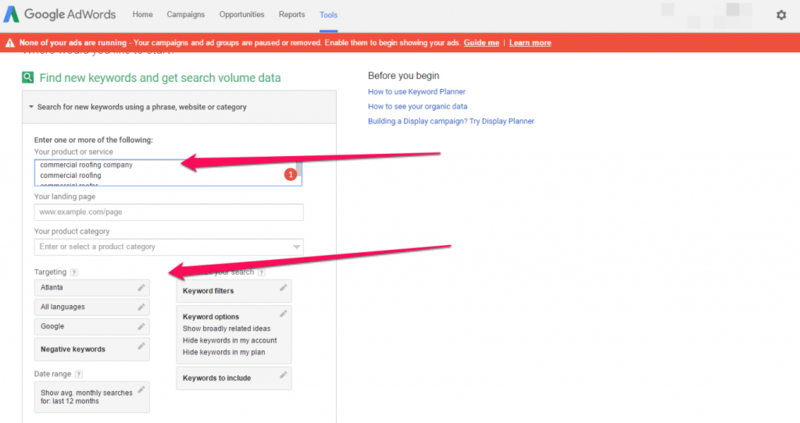 Here are some general strategies that will help you with your AdWords campaign. First, you need to know if AdWords is right for you. If you are in a city with a low population and your target area is small then there might not be enough demand for your services. AdWords works best when there is significant demand for your services in your city. To determine what the best keywords you can use Google’s Keyword planner and perform a keyword search. For example, I am looking for commercial roofing in Atlanta. I look for some keywords that I know will target people that are at the top of the buying cycle. As you can see Atlanta is a competitive market. This is a good and bad thing because we know that your competitors are spending thousands of dollars and it’s working and bad because you have to pay to compete. 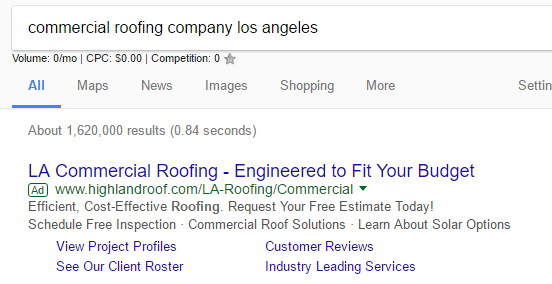 This is a pretty good example of a commercial roofing contractor following this template with Ad extensions in Los Angeles. This is the number #1 mistake that roofing businesses make with AdWords. They send traffic to a homepage vs. a landing page. A homepage is supposed to be like your business card. It’s supposed to contain general information about your business and who you serve. While a landing page is a dedicated web page designed to convert and contain only a specific type of information. A good landing page should have two things: benefit-driven copy and a conversion focused design. One of the most important aspects of making these types of campaigns work is lead response time. According to a study done by Insidesales.com over 71% of web leads are wasted because companies are not properly following up. The chances of qualifying and converting leads drop significantly after 5 minutes. SEO (search engine optimization) is a powerful way strategy that will help you generate commercial roofing leads. The key thing to remember with these inbound marketing strategies is that people’s behavior has changed dramatically. Over 94% of B2B buyers research online for purchase decisions. Did you know that 2017 is going to be the first year in which digital marketing is going to outspend traditional/T.V marketing? If you are not online and have a website that can be easily found through search engines then it’s like you don’t exist and are a ghost. With SEO there are three things to remember. This relates to how well your website is structured. This is why I usually recommend a WordPress site because it is easy to set up with the right SEO. I recommend that you download the plugin Yoast SEO. This plugin will help you set up your site correctly with the right meta tags. Some things to keep in mind when creating a website. There are thousands of people searching for commercial roofing services in your city. You can take advantage of this by reaching those people with helpful content. Marketing has changed. It’s about giving value, teaching others, and serving your audience with great information while telling your story in a compelling way. This is good marketing. Content marketing can do this for you. You can target low competition keywords by writing blog posts with the right keywords. It’s actually pretty easy to rank and be found at the top of the search results for roofing in a lot of cities because of the low competition. Google and other search engines use backlinks to determine how important your site is. Backlinks are links back to your site. A backlink from older more authoritative websites is more powerful than new backlinks. 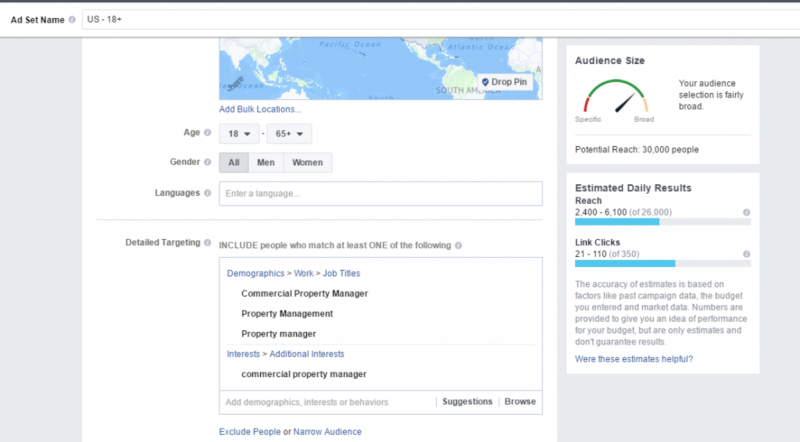 Believe it or not, you can target property managers on Facebook. The main difference between AdWords and Facebook is the AdWords you are targeting people at the top of the buying cycle while on Facebook you are targeting the right demographic but they might not necessarily be interested in your offer. This is why the best strategy on Facebook is to tell a story. You should give value to your prospects first by creating helpful content and then retargeting those same people with an offer. I recommend that you use Facebook as a complimentary strategy in the beginning by using its Retargeting Ad system. You can retarget anybody who lands on your landing page by installing a Facebook pixel. Facebook will continue to be a powerful way to generate B2B leads as the targeting gets more sophisticated and powerful. You might be thinking that nobody advertises through direct mail anymore. Think again. Direct Mail is a very effective strategy that can provide you with a good return on investment. They have lists of everything and you can target whoever you want with a direct mail piece. The most important element in making a direct mail campaign work is the list. If you are not targeting the right people it doesn’t matter what your copy says or what your offer is. Remember in terms of importance your list, offer, and the copy is what make a successful campaign. You have to find a good list broker to make this work. They are not cheap. Some places you can find a good list are NextMark and ConsumerBase. Test different offers to see what converts the best. In the case of a direct mail piece for commercial roofers, you want to test different offers to get a conversation going. Ask them for your worst leak and see if you can fix it at no or low cost. Trade shows all you to sleuth the competition, create new business partnerships, create company awareness, and generate leads that convert to more sales. B2B companies spend most of their advertising budget on trade shows. B2B exhibitions were 39.2% of B2B marketing budgets in 2011. The biggest reason why most trade shows never see an ROI is because over 80% of the leads generated at trade shows are never followed-up. Here are some general guidelines that will help you generate and convert more leads at your trade shows. Make a list of all the property managers, manufacturers, industrial building, commercial property owners, and property managers and contact them directly. Ask them for a meeting and see if you can fix any type of damage they have. Use a combination of phone, emails and social media to set up appointments. I’ve used Linkedin over the last of couple years and have generated hundreds of thousands just from Linkedin. Linkedin is a powerful social media channel that can make a big impact in your business. The challenge for roofing businesses is that there might not enough people active on Linkedin on a local level. On a national level, you can reach enough contacts to generate a ton of business. 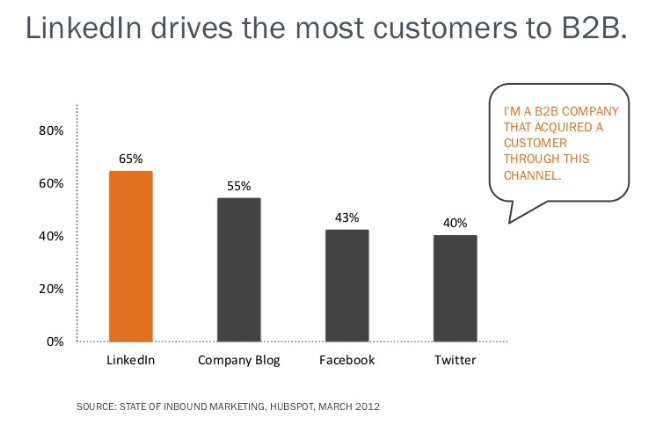 On average Linkedin delivers the most customers to B2B companies. The most important part of making any type of Linkedin campaign work is your profile. Your profile has to be setup like a sales page. You have to call out your target market and state clearly how you can help solve their problems. Take a look at my profile where I call out roofing businesses.